It hurt so bad after adverse reaction to Floxin, the nerves in both legs and achilles tendons were so damaged, I asked the doctor to STOP the test. He did not. I screamed at him... NO MORE. He did not stop. Then I took my fist and pounded his back. I had two achilles tendon ruptures. Chronic pain for 12 years now. On disability. The company who makes this should be brought to Federal Criminal Court and Criminal Court for world wide criminal conduct in violation of UN torture limitations that has been done on civilians for the name of profit. It amazes me that millions of people get prescribed quinolone class antibiotics like Levaquin and Floxin, and most people have no problem, but the small percentage of people that do have adverse side effects get them BAD. And doctors seem to have a problem accepting that drugs they start selling for the pharmaceutical industry could possibly be hurting people. So...your doctor wouldn't stop when you were experiencing that much pain? He probably didn't believe you (despite the evidence right before him). But then, he probably didn't believe you had side effects from the Floxin either. Hi... It's Paul Cahan... with an update. 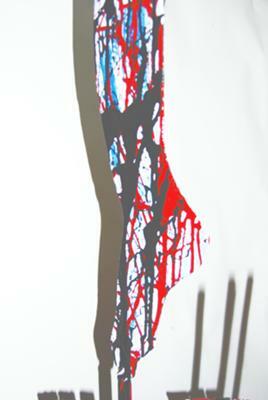 I just saw your site, with the photo of my sculpture. It's nice to see it's being used and not just collecting dust at home. Cool. Art is to communicate truth not just to make money. I don't know where you found the image, but I applaud you! Since I had the severe reaction to Floxin, now called Levaquin, I still suffer from pain in both ankles, and neuropathic type deep bone type pain in the calves. Permanent damage. I purchased enough shares of the Johson & Johnson stock to do a Shareholder Proxy for their APril 2011 meeting to force them to put stronger warning on the bottle itself, not burying important data in fine print. Still fighting back to the bastards who manufacture and market this in a tricky and nasty way to hide the truth as much as they can. You included that picture way back when. I had terrible calf pain and then Achilles Heel tendon pain after my first pill of Levaquin, took 6 altogether and now am wondering whether my PNS condition will ever improve? It has been 20 days since I stopped. Any factual answers out there? I have not seen any. There's plenty of info out and around. Some better/more complete than others. 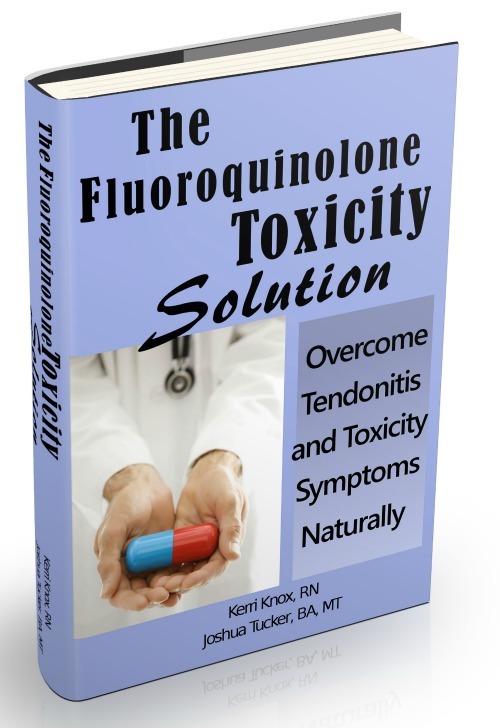 and in The Fluoroquinolone Toxicity Solution (Formerly The Levaquin Tendonitis Solution. Home from hospital and nursing home in 2011 after 3 weeks of levaquin for a leg wound, my broken wrist was also causing trouble. The wrist was not responding to therapy. Pain and numbness to the elbow kept me awake at night. My orthopedist insisted this was a condition completely separate from the break itself. Not likely. I was sent for the nerve conduction test without any literature or preparation. Painful! I almost got up and walked out. I was diagnosed with carpal tunnel, but I resisted surgery. Symptoms went away for the most part and I tried to resume therapy, increasing weights from one to two pounds. That's when the snapping began and I was advised to rest the joint. Now, almost a year later, I have a stiff joint. The hand and fingers are weak and shakey. "Not Likely," is the correct response. It's all connected. 1. Get your Vitamin D level tested. Both are required for bones to heal well/strong, to avoid osteoporosis, etc. And good for lots of other things. And while there's a ton of other things I could suggest, those are the two big, cheap, easy ones to start with. Also, don't take prescription Vitamin D2, as it's research-proven to be FAR inferior to D3 which you can get off the shelf. Let me know your Vitamin D level when you get it. I had the NCT at about 8 months out. nothing ever hurt so bad in my life. i was screaming. it literally felt like they were shocking raw nerve endings. Never felt anything so painful in my life. I too had to have them stop. I could not handle one more shock. The needle test was nothing at all. didnt hurt at all. I would rather die than go through that ever again. I could not move for a week afterwards. Every spot they shocked hurt for at least a week. I literally mean it hurt bad. I can take a lot of pain, could not take that at all. it was pure torture and hell. the lady told me little kids have this test and handle it come on now! I told her i am sorry but i cannot do this. i was literally sobbing by the time i got up and left. never again will i ever go through that. BTW I was diagnosed with Periphreal neuropathy and carpal and cubital tunnel syndrome. I was Floxed in 2015 after I told my doctor I could never take Cipro, because I had taken corticosteroids. I knew the risk. I said NO and he gave to me anyway. Then he changed all the hospital records to show it was Levaquin like that was better. I told him I knew the risk of tendon tearing and he laughed me, said its all over rated and drug raped me anyway. He is the Bill Cosby of Doctors! These type doctors ABOVE ALL DO HARM and are getting kick backs from THE FDA and MegaPharmaceutical companies and should loose their license indefinitely.